You have dozens of emails in your inbox, a couple deadlines looming and a boss that keeps walking past your desk staring over your shoulder. Stressful! Sometimes you just need a minute to take a breath. Don’t feel guilty. We’ve all been there. 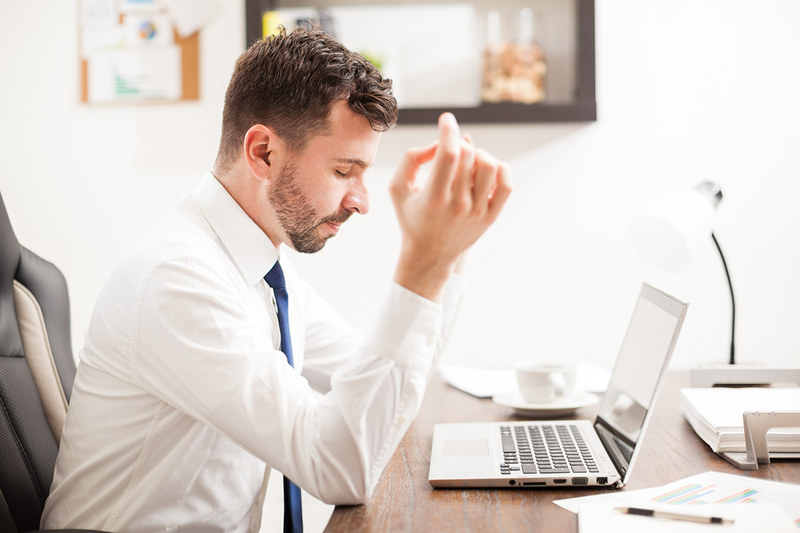 Stress at work is commonplace, but it doesn’t have to be. And you don’t necessarily have to change jobs or take a weeklong hiatus to a tropical destination to relieve all the tension building up. Yes, just breathe. In. Out. Studies have shown that incorporating mindfulness into your workday — by taking a few minutes and using focused breathing to center your thoughts on the present moment — results in lower stress levels. Taking 5 to 10 minutes a day to practice mindfulness also helps lower blood pressure and improves the immune system, according to Laurel Geise, founder and CEO of The Geise Group, a corporate training and consulting firm that helps companies integrate mindfulness programs into their corporate culture. Think: fewer doctor visits and no more stocking up on Advil. The benefits extend beyond the personal to the professional. Geise says incorporating mindfulness into your workday can improve your concentration, ability to stay focused and time management. So How Exactly Do You Practice Mindfulness? Mindfulness doesn’t require intensive background knowledge or any investment in equipment — only time. And you can start by just taking five minutes a day, twice a day. “As long as you’re breathing, you can practice mindfulness,” Geise said. When thoughts enter your mind, return to the breath. If your mind wanders, go back to your breath. Practice for five minutes a day. Though Geise said it doesn’t matter how you breathe — in through the nose and out through the mouth, in and out through the nose, or in and out through the mouth — what’s more important is that you are in a comfortable position so you aren’t taking the focus away from your breathing. But you don’t want to get too comfortable. Falling asleep is not the goal. For those interested in developing a more formal meditation practice, she said 20 minutes twice a day gives you optimal benefits. When Should I Push the Pause Button? Geise said the best time to put mindfulness into practice would be at the beginning of your day, then right after work. Do it before you get a cup of coffee or pick up your phone, she said, and then when you leave the office as a way to release the stress and anxiety built up through the day. Taking a mindful moment during your lunch break can also be beneficial. “I think it’s a great practice to have before you go back into full work mode because it helps you to get focused… into the afternoon,” Geise said. For those crazy-busy, always-on-the-go folks who think taking a break in their day to essentially do nothing at all is counterproductive, she argues the opposite. Five minutes isn’t a huge amount of time when you put things in perspective. You’d spend that much taking a quick bathroom break or waiting for coffee to brew in the break room. Once you’re in the practice of rewiring your brain to better handle stress, it’s only right that you share your enlightenment with your co-workers. Anxiety can affect others around you. Why not have everyone in your office feeling zen? A 2014 research study by the University of North Carolina’s Kenan-Flagler Business School found that bringing mindfulness to work lowered absenteeism and turnover, increased productivity and enhanced work relationships. That’s reason enough to convince your boss it’s important to take a break to breathe every now and then. Apple provides its employees with 30 minutes of meditation each day, on-site yoga, meditation classes and a meditation room. Google offers around a dozen courses on “mindfulness meditation” — it introduced its first course, “Search Inside Yourself,” in 2007. Marc Benioff, CEO of software company Salesforce, is such a big fan of meditation he put meditation rooms on every floor of the new Salesforce building in San Francisco. HBO’s headquarters offer a variety of relaxation options: it has a gym, yoga classes and weekly meditation. Procter & Gamble employees can take advantage of meditation spaces and classes at the P&G corporate centers. Your Turn: Do you practice mindfulness to de-stress from the workday? Nicole Dow is a staff writer at The Penny Hoarder. Practicing mindfulness has increased her inner peace, though she’s not sure if her 2-year-old will tolerate her taking many five-minute breaks of quiet at home.